285. Theory. If we conceive of a simple leaf becoming a compound one, on the principle of " deficiency of tissue between the veins," it will be evident that the same forms of venation are represented by the branching petioles of the latter as by the veins of the former. The number and arrangement of the parts will therefore in like manner correspond with the mode of venation. 286. Leaflets. The divisions of a compound leaf are called leaflets, and the same distinction of outline, margin, etc, occur in them as in simple leaves. The petiolules of the leaflets may or may not be articulated to the main petiole, or rachis, as it is called. Compound leaves. 157, Trifolium repens. 15S, Desmoriium rotundifolium. 160, Glotidium. 287. Pinnately compound. From the pinnate-veined arrangement we may have the pinnate leaf, where the petiole (midvein) bears a row of leaflets on each side, either sessile or petiolulate, generally equal in number and opposite. It is unequally pinnate when the rachis bears an odd terminal leaflet, and equally pinnate when there is no terminal leaflet, and interruptedly pinnate when the leaflets are alternately large and small (159, etc). 288. The number of leaflets in the pinnate leaf varies from thirty pairs and upwards (as in some acacias), down to three, when the leaf is said to be ternate or trifoliate; or two, becoming binate, or finally even to one leaflet in the lemon. Such a leaf is theoretically compound, on account of the leaflet (blade) being articulated to the petiole. 289. A bipinnate leaf (twice pinnate) is formed when the rachis bears pinna or secondary pinnate leaves, instead of leaflets, and tripin-nate (thrice pinnate), when pinnae take the places of the leaflets of a bipinnate leaf. When the division is still more complicated the leaf is decompound. 290. Transition leaves. 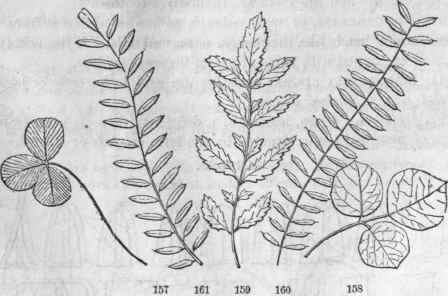 Different degrees of division often exist in different parts of the same leaf, illustrating the gradual transition of leaves from simple to compound in all stages. 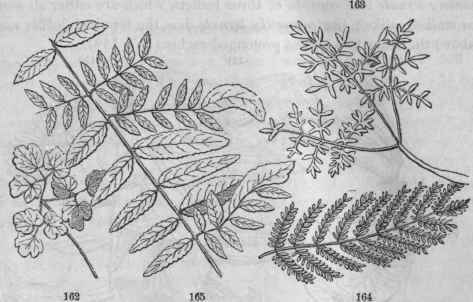 The leaves of the honey-locust and coffee tree (Gymno-cladus) often afford curious and instructive examples. 167, Lemon. 163, Jeffersonia. 169, Potentilla anserina 166, P. tridentata. 291. A biternate leaf is formed when the leaflets of a ternate leaf give place themselves to ternate leaves, and triternate when the leaflets of a biternate leaf again give place to ternate leaves. 292. Palmately compound. A distinction. The palmate venation has also its peculiar forms of compound leaves, as ternate, quinate, septinate, etc., according to the number of leaflets which arise together from the summit of the petiole. Ternate leaves of this venation are to be carefully distinguished from those of the pinnate plan. The pal. mately ternate leaf consists of three leaflets, which are either all sessile or stalked alike; the pinnately ternate has the terminal leaflet raised above the other two on the prolonged rachis (157, 158). Insertion of leaves. 170, Aster oblongifolius? (amplexicaul). 171, Uvularia perfoliata. 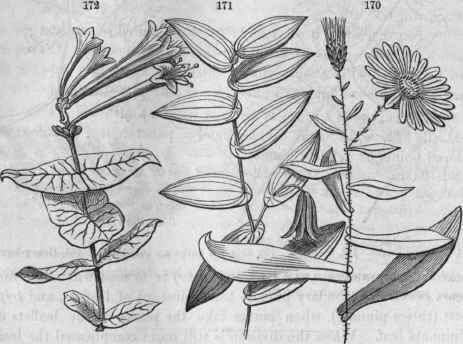 172, Lonicera seuipervirens, (connate). 293. Amplexicaul, when its base lobes adhere to and clasp the stem. Should these lobes extend quite around the stem and become blended together, on the other side a perfoliate leaf will be formed (per, through, folium, leaf), the stem seeming to pass through the leaves. 294. Connate denotes that the bases of two opposite leaves are united so as to form one piece of the two. OF TEXTURE AND SURFACE. In descriptive botany it is also needful to regard the variations of leaves in the above respects. The terms which we briefly notice below are equally applicable to any other organs. 295. In texture leaves may be membranous, or coriaceous (leathery), or succulent (fleshy), or searious (dry), rugous (wrinkled), etc., which terms need only to be mentioned. 296. In the quality of surface, the leaf may be glabrous (smooth), destitute of all hairs, bristles, etc., or scabrous (rough), with minute, hard points, hardly visible. 297. A dense coat of hairs will render the leaf pubescent when the hairs are soft and short; villous when they are rather long and weak; sericeous, or silky, when close and satin-like; such a coat may also be lanuginous, woolly; tomentous, matted like felt; or Floccose, in soft, fleecy tufts. 299. Setous, when beset with bristly hairs called setae; and spinous when beset with spines, as in the thistle and horse-nettle. Leaves may also be armed with stinging hairs which are sharp and tubular, containing a poisonous fluid, as in nettles and Jatropha stimulans. 300. A pruinous surface is covered with a bluish-white waxy powder, called bloom, as in the cabbage, and a punctate leaf is dotted with colored points or pellucid glands. 301. Double terms. The modifications of leaves are almost endless. Many other terms are defined in the glossary, yet it will be found often necessary in the exact description of a plant to combine two or more of the terms defined in order to express some intermediate figure or quality; thus ovate-lanceolate, signifying a form between ovate and lanceolate, etc. 302. Sub. The Latin preposition sub (under) prefixed to a descriptive term denotes the quality which the term expresses, in a lower degree, as sub-sessile, nearly 6essile, subserrate, somewhat serrate.